1. When using a web link (that does not open in a new window), use the browser back button to return to this document. OR navigate to the link using RIGHT CLICK, OPEN IN NEW TAB. If the link opened in a new window, just close that window. 2. To view a footnote, click on the footnote number. To return, click the number in the footnote. As a child, young Winslow Homer (1836-1910) was perfectly situated to have been influenced by the ideas of Washington Allston (1779-1843), America’s first romantic painter. When Winslow was six years old, the year before Allston died, the Homer family moved to the small town of Cambridge, Massachusetts, where they lived about a mile from Allston’s house and studio. Allston was already a legend, but the legend continued to grow during Winslow’s childhood. There were biographies and articles written, posthumous works that were published, lectures, and exhibits of his paintings. In the 1840’s and 50’s, Allston’s influence was well established in American culture, but that influence would have been most compelling to a child in Cambridge desiring to be an artist. I know now that Winslow Homer was influenced by the ideas of Washington Allston, but I had no knowledge of Allston when I started this research. My research began in 1988 after I first saw extra images in a Homer painting, images of things, which were not part of the real picture, which were “instead of, or in addition to” things that were part of the painting. I saw faces embedded in bodies of water, in rocks, and in trees. The more I looked at Homer’s other works, the more I found these, ostensibly out of context, extra images. Why did Homer paint these perplexing images? That was the question. They were not real objects in the scene of the picture, but these “in addition to” images were really there. I was not projecting. His art was intensely personal and intensely American. With admirable loyalty his brothers scrutinized every personal detail with sole regard to what he would have been likely to approve, and the family habit of reserve in such matters is strong. The best things are often those which do not get into print. The reader has the privilege of reading between the lines, and if he chooses to exercise it here, he will find nothing but what is creditable and honorable to Winslow Homer. The images I saw were intensely personal and my survey of the literature had discovered nothing about this in print. Exercising my “privilege of reading between the lines,” it seemed reasonable to think that Winslow Homer must have wanted to keep these private images secret. Perhaps, like poetry or the punch line of a joke, he did not want his pictures spoiled by explanation, but discovered and appreciated through experience. I did not remember the exact comment, but I recalled reading that Homer had said something like that. Since I had not found any mention of these images in the existing literature, I changed my focus and started reading about Homer’s associations and friends. There was material available about The Tile Club, The National Academy of Design, The Century Club, and the American Academy of Arts and Letters. There was also material written by his friends: Hopkinson-Smith’s stories, La Farge’s many books and articles, James Edward Kelly’s unpublished material in the Archives of American Art, some material from Edwin Austin Abbey, Elihu Vedders’ autobiography, and Albert Kelsey’s series of articles, congressional testimony, and privately published autobiography (click here for a pdf copy). I learned a lot about Winslow Homer, his friends and connections that I had not read in books specifically written about Homer. I anticipated La Farge might be especially revealing, since Charles L. Homer was reported to have said John La Farge was the only person with whom Homer enjoyed discussing theories of art. As you will see later, he was. From reading La Farge and Vedder, it became apparent I should find out about Washington Allston. Eventually I read Allston’s Lectures on Art. The answers I was looking for were in Allston’s writing. Allston had detailed reasons for artists to paint these images. I read more material from Allston’s associates and found even more relevant information. It was surprising, but it made sense, that the answers I had been looking for came from the exact time and place of Winslow Homer’s childhood, the 1840’s and 50’s in Cambridge. The pieces of the puzzle had come together. Henrietta Benson Homer (1808-1884), Winslow’s mother, grew up in Cambridge and was a skilled watercolorist. She was likely to have been the most significant influence nurturing young Winslow’s developing artistic skills. As an artist in Cambridge, she certainly would have known Allston’s ideas, perhaps firsthand. After reading Allston’s writing and the writing of many of Allston’s associates, it is not surprising to see Allston’s influence visible in Winslow Homer’s art. What is surprising however, in fact amazing, is that Allston’s influence is clearly manifest in a drawing done by Homer when he was only ten years old. 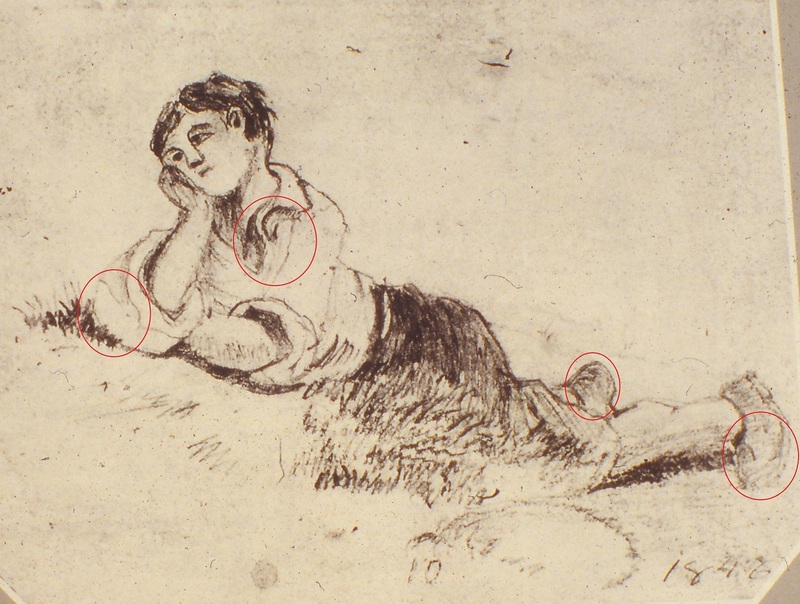 Winslow’s drawing Adolescence, dated 1846, only three years after Allston’s death, exhibits specific evidence of Allston’s influence. Even that earliest drawing has some of the “instead of, or in addition to” images. Before discussing the drawing, we will first consider the concept of these images. In the writing of Washington Allston, and the writing of many of his friends, readers are encouraged to see a particular kind of visual phenomenon, which is the same kind of phenomenon I see represented in Winslow Homer’s paintings. In psychiatry it is called pareidolia. The term pareidolie was introduced by the German psychiatrist, Karl Ludwig Kahlbaum in articles published in 1865 and 1866. In an 1867 British medical journal article reviewing Dr. Kahlbaum’s article, the German word Pareidolie was translated into English as pareidolia. I also found pareidolia discussed in a 1997 English edition of Karl Jaspers General Psychopathology, which was originally published in German in 1913. Although the word is rarely found in general dictionaries, it has a long history in psychiatry. Pareidolia is somewhere between illusion and hallucination, and is regarded to be a part of normal health. So what is pareidolia exactly? … there is necessary an external and individual object very nearly corresponding in character to the false perception, whose objective stimulus blends with the deficient subjective stimulus, and forms a single complete impression. This last is called by Dr. Kahlbaum, changing hallucination, partial hallucination, perception of secondary images, or pareidolia. A type of intense imagery that persists even when the subject looks at a real object in the external environment; image and percept exist side by side, but the image is usually recognized as unreal. A type of intense [image from the mind's eye], that persists even when the subject looks at a real object in the external environment; [what is seen through conscious attention] and [the external visual stimulus] exist side by side, but [what is consciously seen from the mind’s eye] is usually recognized as unreal. The process begins with a pattern in the material being perceived, that somehow objectively corresponds to something that is actually not physically present, but which exists as a memory in the viewer’s brain. The effect occurs when the brain associates a pattern in the viewed material, with a memory of that corresponding object stored in the brain. The pattern is seen as the recognized object, even though that object is not physically present. Here is the same description from a data processing perspective. Your eyes scan where you are looking and your brain’s pattern recognition processing codes the objective visual characteristics. The brains processing then correlates the coded characteristics with the database of coded images stored from your previous experience. The image displays when the scanned objective characteristics are correlated [matched] with characteristics of the stored memory. When you see what you are looking at as the remembered object, even though that object is actually not physically present, that is a pareidolia. It is part illusion because the pattern does physically exist, and it is part hallucination because you are seeing a remembered object, not something physically present. Pareidolia may also be considered a false positive. Allston, and a number of his friends, encouraged people to seek this kind of experience, and they considered it desirable, elevating, and spiritual. While the pareidolic object seen is not physically present, they regarded the object as spiritually present and a poetic truth. 3. very nearly corresponding in character to the false perception, whose objective stimulus blends with the deficient subjective stimulus, and forms a single complete impression. 1. Objective correlatives (physical characteristics) exist in the external material being viewed and are used for comparison. 2. There is an internal object stored in the viewer’s memory. 3. When the external material being viewed and the internal stored memory are matched up because of their similarities, the material being viewed is seen as the remembered object, even though the remembered object is not physically present. Pareidolia involves no abnormalities or mental disorders. The steps listed above are exactly the same as normal visual perception except for one point—the object seen is simply a false positive initiated by the objective correlatives that are physically present. Pareidolia is also sometimes referred to as a secondary image, a double image, or a projection (Rorschach tests). I have chosen to use the word pareidolia for the following reasons. The term double image has additional unrelated meanings. When we later discuss Primary and Secondary Imagination, the terms secondary imagination and secondary image, while they are related are not identical. The use of secondary image as the descriptive term introduces words that are confusingly close to secondary imagination. Finally, projection is not the same as pareidolia, since projection suggests the objective correlatives may not actually exist in the material being viewed. The term pareidolia is clearly defined and not confused with other concepts. As an abstract pareidolic example, one might see a pareidolic face in the front of a car. The car is not at all ambiguous. All that might be necessary to see the image of a face, in addition to or instead of the car, could be the two headlights (as the eyes), the grill (as the nose), and the bumper (as the mouth), but only if the objective stimulus seen sufficiently correlates with the idea of a face. A curved bumper (more like a smile) and an oval grill (more like a nose) might help to make those objects correlate better in the mind. If you can imagine this non-existent car as described and also imagine that you see the abstract face, you are imagining a pareidolia. The painted pareidolias I see in Homer’s works are much more realistic in appearance than this imaginary car-face example. For pareidolia, the viewer does not have to see a vivid image and normally is not fooled by the image. Although it is perhaps most common for pareidolic images to be found in a vague or ambiguous stimulus, such as a cloud, a crashing water wave, or a weathered wall, pareidolia does not require vagueness or ambiguity, and even in those cases, does require, by definition, the existence of an objective similarity between the material being viewed and the stored memory. Pareidolia is not defined by its degree of vividness, how real it looks, how abstract it is, but by the requisite conditions. Pareidolias can be seen throughout Homer’s works, starting with his earliest works. Here are two examples. This drawing by Winslow Homer is dated 1846, which indicates it was done when he was ten years old. 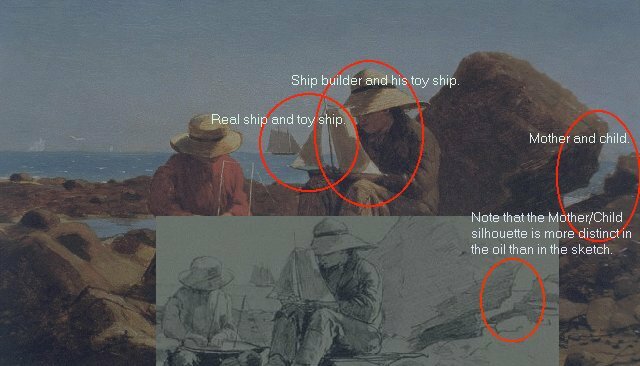 It is a very significant example, since it establishes that Winslow Homer saw and used pareidolia at an early age. In Adolescence, there are drawn pareidolic images of two fish. In the context of the picture, the fish are really the shirt collar and lapel. There is a pareidolic image of a rabbit. In the picture, the rabbit is really the right arm of the boy’s shirt. There are also two pareidolic faces in the shoes. In the picture, each face is a wrinkle pattern that happens to look like a face in each shoe. Following Washington Allston’s theoretical modus operandi, the fish and rabbit are objective correlatives used to convey information about the boy, suggesting his thoughts and characteristics, which help to define his spirit. The faces in the shoes, give the shoes “character,” a methodology Winslow Homer taught to James Edward Kelly (1855-1933). On the right side of Homer’s painting Boat Builders there is an opening between two rocks. The silhouette formed by the open space between two rocks creates a pareidolic image of a mother looking, face to face, at a very young child. In the sketch for this painting, one can see a less defined image of the mother and child. The painted representation of the mother and child is significantly more developed and defined, which, for me, leaves no doubt about Homer’s intention. He saw the pareidolia and painted what he saw. This mother child image is a poetic truth, which also may function in the theme of the painting. It is interesting to note that the same year Homer painted Boat Builders, he also illustrated a book for James Russell Lowell titled The Courtin’ in which all of the illustrations were also silhouettes. An understanding of the poetic meaning of this painting would perhaps best be found however by comparing it to Longfellow's poem The Building of the Ship along with Homer's wood engraving Shipbuilding, Gloucester Harbor. It is significant that pareidolias exist in Homer’s earliest work, created prior becoming an adult, because this is when Homer was closest to the influence of Allston’s legacy. The Boat Builders example is significant because there is a sketch available for comparison and that one example is perhaps the most convincing regarding Homer’s conscious intention because the mother/child image is more defined in the painting than in the sketch. This need not be a vaporous pursuit. Once we become aware of our perception—how we see a thing instead of, or in addition to, what the thing is—all manner of new experiences can hold our attention. In Winslow Homer’s painting, for example, the simple forms created by the momentary vision take on a structure of their own, creating a surprising feeling of almost breathless equilibrium, fixed by a glance. To encounter this seemingly unconstructed but undeniable poise within the free-wheeling process of our perception strikes us as a happy miracle, a moment of unimposed order in a chaotic visual world. What Joshua Taylor describes is by definition pareidolia. Consider his words, “…we see a thing instead of, or in addition to, what the thing is.” With his carefully worded concise description, he clearly is writing about a pareidolia painted by Homer, but he was not specific about what it was he saw. High Cliff, Coast of Maine does contain pareidolias, and one that I particularly like, since it has a connection to Washington Allston. A most convincing “in addition to, what the thing is” appears to be a representation of the right sister from Allston’s painting Two Sisters. While the scene of the painting is a representation of the rocky sea coast in Maine, an image of the right sister exists in the painting as a painted pareidolia. To see the image, it may help to already have a visual memory of a similar object, so first study the head and shoulders of the right sister in Allston’s painting The Two Sisters. Taylor’s choice of the word “poise” seems particularly appropriate for this image, which makes me think this is the “in addition to” image Taylor saw. Visions - A Book by Edward H. Clarke, M.D. It was left by Dr. Clarke to my decision what disposition should be made of the manuscript. I had heard many portions of it, and discussed many points involved in it with him. Visions have always held, and still hold, a place among the experiences of mankind. From the time that Abraham had a vision of angels in his tent, to the latest manifestation of modern spiritualism and spirit seeing; among all nations, savage, civilized, and enlightened; in all classes, whether cultivated, and enlightened; in every phase of human development, oriental and occidental, Pagan, Christian, and Mohammedan, there have been those who saw, or who pretended to see, visions. Visions have not only been recognized as part of the mysterious phenomena of disease, but of the equally mysterious phenomena of health. The hearty and strong, as well as the morbid and ill, have been visited by them. Neoromancers and charlatans, seers and prophets, enthusiasts and sober minded people, those who have deluded, and those who have inspired, the race, have, with varying degree of earnestness and success, supported their claims to reverence or obedience, by the assertion that they could see what was hidden from the eyes of others. Clarke dealt with the full spectrum of visions, but clearly he recognized some visions to be a part of normal health. In the next selection, Clarke is writing about pareidolia, although he did not use that terminology. Fifty plus years ago, I had an incredible English teacher, The Learned Doctor, we called him. He expounded incredible interpretations of poetry. Initially, I thought he was reading in much more than could possibly have been intended by each poet. Perhaps he was, but that became irrelevant as I learned how poetry should act as a catalyst for our imagination. Reading into poetry was not the problem I had thought it was. Eventually I came to understood the larger intention of the poet is to stimulate the reader’s imagination. Great poetry contains an infused richness of thought, which cannot be comprehended unless we permit our imagination to run without logical limitations. When experiencing poetry, we must allow our imagination to be indirectly led by the poet, with the poem as the springboard for our imagination. That is necessary if we are to perceive and comprehend beyond the explicit statements. After reading and learning more from the poet, we may eventually discover that our reading into was not our projection, but actually only a reading that was actually led by the poet. The issue of reading versus reading into with poetry presents the same non-issue issue as seeing versus projecting with the works of Winslow Homer, who, by the way, gave himself the nickname The Obtuse Bard. If you have a governor on your visual imagination, you will limit your appreciation of Winslow Homer. To see Winslow Homer’s visual poetic truths, your imagination must be on full throttle in order to jump through his obtuseness. When we look at paintings, we are looking at representations. Except for the canvas and paint, everything we see is something not materially present. Anything in a painting is never anything more than a representation. All we see is the physical painting, or perhaps we are looking at, something even less real, a reproduction of a painting. Even if Homer had seen some kind of sublime vision in Nature, rest assured, we cannot know exactly what he saw. We are left with only the painting. We may see incredible effects, incredible representations, but what we see in the painting cannot actually be supernatural or Sublime. This is because we are not looking at The Creator’s work, we are looking at Homer’s work. Yet, according to Allston, according to what he wrote in his Lectures on Art, the artist may be able to make the painting function as if it is Sublime. Looking at Nature, Allston and his friends literally sought to see pareidolias, and they gave Divine attributions to those pareidolias. Washington Allston frequently told ghost stories to his friends and you might even say that he saw ghosts when he saw a person in a pareidolia. For him, these experiences were Sublime. In art, Allston wanted to duplicate that Sublime effect, so that people who viewed the art might also feel the Sublime, as he did in Nature. Allston understood the difference between Divine creations in Nature and an artist’s creation, so here is where pareidolia changes. Placed in an artwork, a pareidolia the artist saw and painted is but an artistic device, a technique, or to use Allston’s phrase, a modus operandi, with a purpose. It is an attempt to make the viewer feel Sublime or emotional spiritual effects, something beyond the physical. For Allston, such Natural visions were spiritual and elevating experiences of the Sublime, which if placed into art, could be a catalyst for the viewer to experience those same feelings, if the viewer had a sufficiently capable imagination. When you see a pareidolia in a Winslow Homer painting, you are looking at an artistic device that follows Washington Allston’s modus operandi for creating an artwork with Sublime or other spiritual effects. To a pareidolia seen in Nature, you may attribute whatever mystical meaning your philosophical religious beliefs might permit. Call it a ghost, divine, or a sign. A pareidolia seen in one of Homer’s paintings is not a Natural pareidolia, in the painting it is but an artistic device. Any object you see in a painting is an illusion, since it is not really there. Of course with realistic scenes such as in Homer’s paintings, we can easily distinguish between objects that are real objects within the material context represented in the painting and those that are not real in that context. In this material, when I refer to an out of context painted image, I may use the term painted pareidolia, sometimes I may simply use the term pareidolia, or I may describe it in another way, such as unreal or as an in addition to image. I hope to make a reasonable case explaining why Winslow Homer saw and painted pareidolia, so that readers may overcome the rational psychological block that seems to keep people from seeing and appreciating these images. Understanding why Homer painted these images should make it easier for everyone to experience them. There must be some, perhaps many, who have already seen and are familiar with these pareidolic images in Homer’s work. If that is you, I hope this material helps you share what you see. In the future chapters, details will be presented regarding Winslow Homer’s cultural background in Cambridge, Massachusetts, as it relates to the influence of America’s first romantics, Richard Henry Dana, Sr. and Washington Allston and their associates. Details are also presented from information drawn from the writing of some of Homer friends, such as Edwin Austin Abbey, James Edward Kelly, Elihu Vedder, Albert Kelsey and John La Farge, and drawn from material about the various associations of which Homer was a member. Washington Allston and John La Farge are central to an understanding of the private world of Winslow Homer, and so considerable portion of this material is devoted to their writing. I have been struggling with this material for twenty-five years. I have been driven to write this because fate seems to have dropped me here, with this limited, narrow, and perhaps unique perspective regarding Winslow Homer. At times, this seems an impossible task, attempting to explain to others what they do not even see. All of the time, I feel unprepared to do this, but perhaps that is one of the important lessons of life. I will never be prepared, and since I was born in 1944, I may never be more capable than now. For better or worse, in the current moment, I have an opportunity to try. So I must simply fumble and bumble along, dealing with this task fate seems to have assigned to me, and hope, if I am able to finish, that what I did is worthwhile. My hope is that I may help unlock the door to Homer’s intensely personal and private world of phenomenological spiritual realities recorded in his works. During his lifetime, Homer never wanted to explain his works; Homer did not want spoilers. I respect that Homer wants to communicate with you directly through his works, but since it is now more than one-hundred years after his death, I believe the spirit of Winslow Homer will not object to the spoilers presented here. Sometimes my imagination even gives me the feeling that he may even be pulling me along. The quoted words are not mine. The source of that wording is indicated later in this chapter. I eventually did find two items. Details regarding that are later in this chapter. What I did not remember was, “I regret very much that I have painted a picture that requires any description.” From a letter to Knoedlers, February 17, 1902. “Die verschiedenen Formen der Sinnesdelirien. Ein Beitrag zur Erweiterung der psychiatrischen Symptomatologie und zur psysiologischen Psychologie.” by K. Kahlbaum. Centralblatt für die medicinishchen Wissenschaften, No. 57, 23 December 1865. p. 908ff. “Die Sinnesdelirien” by Dr. Kahlbaum. Allgemeine Zeitschrift fürPsychiatrie und psychisch-gerichtliche Medicin, Volume 23. Berlin, 1866. p. 81. In German the word is pareidolie. “On Delusions of the Senses” review by John Sibbald, MD. The Journal of Mental Science, Volume 13, Number 26, July, 1867, p. 235 ff. Jaspers, Karl. General Psychopathology, Volume 1, 1997, p. 65ff. I have seen instances where the term pareidolia has also been applied to sounds perceived, but I am only dealing with images. “On Delusions of the Senses” review by John Sibbald, MD. The Journal of Mental Science, Volume 13, Number 26, July, 1867, p. 238. Campbell, Robert J., MD. Campbell’s Psychiatric Dictionary, Oxford University Press, 2003, p. 480. Objective correlative is a term introduced by Washington Allston. More on this latter. A false positive is a term used in scientific studies where the study conclusion results in a hypothesis being considered as true when it is actually false. With pareidolia, after the brain “studies” what is being viewed, the brain falsely concludes that the stored image is a match. The studied visual data matches, but the conclusion is false, because the object indicated is not really there. Oliver Wendell Holmes, M.D. (1809-1894) was a son of Rev Dr. Abiel Holmes (Minister of the Shepard Congregational Society, the congregation Washington Allston and Richard Henry Dana Sr. had attended in Cambridge) and father of Oliver Wendell Holmes, Jr., a United States Supreme Court justice. He was a medical doctor at Harvard Medical School, for a time director of the Harvard Medical School and also a writer and well known poet. His friend and colleague, Edward H. Clarke, M.D. also taught medicine at Harvard. When Dr. Clarke died, his unfinished manuscript on visions was prepared for publication by Dr. Holmes. Holmes also knew and wrote about Washington Allston. Edward Hammond Clarke, Visions: A Study of False Sight (Pseudopia), Houghton Osgood, Boston, 1878, p. 5. My teacher, The Learned Doctor, was Norris D. Hoyt. His teaching provided a critical foundation for my understanding of Winslow Homer and John La Farge. Later I will review John La Farge on this topic with regard to painting and Winslow Homer.